The "System" section describes the features of Project RPG.XLS role playing game from the non-technical perspective. Gaerhorn is the name of the kingdom in which the game events take place. I decided to use "Chronicles of Gaerhorn" second title to indicate that maybe other games will be produced using these settings. The title artwork may suggest a gloomy theme, as this is the fact. I will try to create a fantasy-noir style game, with dark atmosphere and a lot of mysteries. RPG.XLS engine is designed for single-player single-character turn based role playing game. This design is both the question of programming and computing complexity (VBA interpreter is rather slow) and personal preferences. The game will use old-school classic 2D top-down view, with the main screen composed of 19x19 tiles. Default movement option is fast and simple eight-directions keyboard movement. Alternatively, mouse "click and go" movement is also possible. Spellcasting and most other interactions will use a point-and-click interface and menu system based on Userforms. Game world is divided into locations. The size of a standard outdoor location is fairly large with 209 x 209 tiles (or 11x11 full screens). There are many special smaller sub-locations like cellars or underground caves. The game will feature area map that shows the explored part of each location. 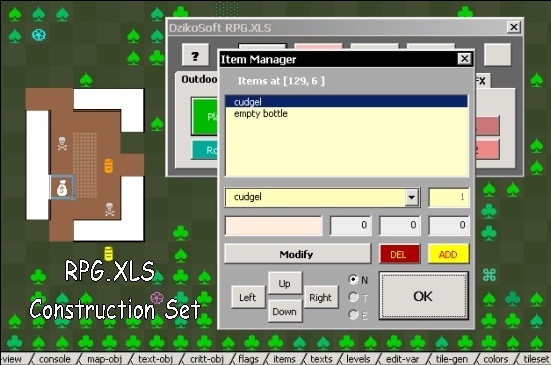 RPG.XLS will incorporate conversation engine based on dialogue trees, convenient categorized inventory system, turn based combat with separate combat screens, fully hand-placed (i.e., non-random) loot, scripted time-dependent events in the gameworld and many other interesting features. There will be multiple save game slots, and saving will be possible any time outside combat. I will try to add some nice static screens, midi music and sound effects, but it depends on the availability of external resources (contributors welcome!). The are many different sub-genres in fantasy-themed games: some prefer Tolkien-style worlds filled with elves, humans and dwarf, other cater towards "knights and wizards" medieval settings, and others prefer harsh fantasy worlds in the style of "Conan the Barbarian". The world in RPG.XLS will lie somewhere between the last two options. Humans are the only civilized creatures: there are no elves, dwarves of goblins, but there are many supernatural beings like undead or demons. There are kingdoms similar to medieval feudal societies, but larger and with stronger, centralized rulership. Elemental based magic and healing-oriented alchemy are popular arcane arts. Polytheistic religion plays an important role, as gods in a subtle but powerful way affect the life of the individuals. Necromancy and demonology are considered sacrilege. Practitioners of black magic are fiercely pursued. The action of the game will take place in a small peripheral province - a cold and rainy land filled with swamps and dense forests. It was one an important agricultural and mining region, until it was desolated by the dreadful plague one hundred years ago. The area contains several villages, a small fort and a wasteland that serves a refuge for different outlaws: from simple smugglers to dreadful black magic cultists. Open-endedness: the game will not artificially limit the freedom of movement and exploration. There will be multiple solutions to most problems, and usually you will be able to choose between combat, negotiations or trickery. Artificial constraints like "locks that cannot by picked" or "sleep only in town" are generally avoided. Many quest will have open-ended nature, like you are asked to deliver a valuable alchemical component, and the are really a lot of ways to complete it. Challenge: I don’t want the game to be outrageously difficult, but I want it to be challenging. Thus, there will be no hand-holding devices like level-scaling or quest compass. Choices have consequences, through mostly delayed. Vitality is a valuable resource and healing is neither instant not widely available. Time matters. Character should always think twice before taking a shortcut. Details: I will try to make the gameworld logical. For example, the game will follow "true inventory" principle: if you fight and enemy armed with sword and dressed with leather armor, he will drop the sword and leather armor when defeated. Quest will make sense: as a perfect stranger character will not be asked to deliver something of value, but rather he may be offered a dirty and dangerous task, as no one will cry over his death anyway. Strong story: I believe that the story is very important in RPG. Good story could compensate for inferior interface or mechanics, but not the other way. Thus, even taking into the account the freedom of exploration, the game will be "story-driven" rather than a sandbox type of RPG. I want the main plot not to be "just a quest, only bigger than others", but to truly engage the player. When designing general mechanics I tried to avoid two problematic extremes: too much randomness and "all-or-nothing" binary checks. System involves too much randomness, if the skill test depends on a single roll. For example, with your lockpick skill, there is a 20% chance of opening the given lock, otherwise the lockpick breaks. This is not a good solution, in my opinion, as it temps to reload and re-trying and the game may look unfair, unbalanced or even illogical sometimes. On the opposite side there are binary checks. No random rolls at all. If your lockpick skill is, for example, 5 or greater you are able to open a given lock, otherwise you can’t. Many designers may consider such system fair and realistic, but it is also quite restrictive and rather inflexible. But there may be a system that neither rely on randomness, nor is based on "all or nothing approach". The good example of such system is that of Deus Ex, in which your lockpick skill determines the amount of lockpicks you have to use up to open the lock. This is still meaningful constraint, but not as restrictive as binary one. RPG.XLS will use similar approach. You can still open the difficult lock if you are less skilled, but you will waste several lockpicks and may alert the nearby guards. Most skills will work that way offering quantitative bonuses rather than involving random rolls or binary checks. If you are skilled, you will use a single lockpick and you action will be considered stealthy - it will not cause any hostile reactions of nearby creatures. There are also workarounds. You may also bash the doors or chests to open them, but it certainly alarm the nearby guards, and bashing the container may destroy some of its fragile contents.